As much as we enjoy heading to Palm Springs to lounge poolside with a cocktail or unwind with a massage at one of the many hotel spas, sometimes we’re looking for more of an adventure out in the desert. 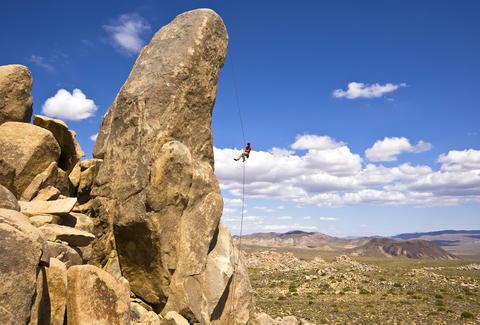 Thankfully, there’s no shortage of outdoor activities in Palm Springs and the surrounding area to get your blood pumping, from rock climbing and mountain biking to off-roading along the San Andreas Fault and burning rubber on a race track. 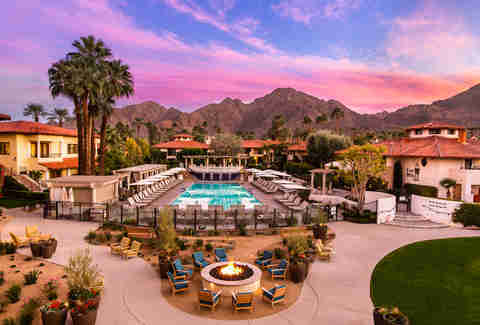 Whether you’re heading out to Coachella, the Palm Desert Food & Wine festival, or just looking to escape the usual routine, we explored the best ways to get off the beaten path on your next visit. 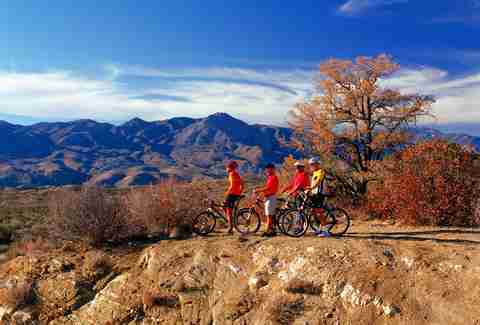 By foot or on horseback, on wheels or up in the air, here are the best ways to have an excellent adventure in the Palm Springs area. Trekking through the desert may not sound like everyone’s dream vacation, but Palm Springs is home to tons of spectacular hiking spots. The Indian Canyon Trails offer some excellent hiking options, not only because they provide welcome respite from the sun with cooling streams and shady oases, but also because you can learn about the Agua Caliente Cahuilla Indians, thanks to preserved artwork and historic sites. 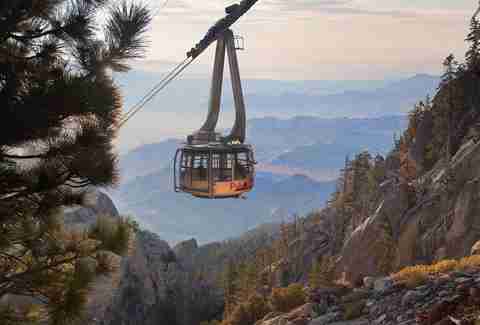 You’re also definitely going to want to climb aboard the rotating cars of the Aerial Tramway, which will take you on a 2.5-mile ride up to 8,500ft where you’ll find over 50 miles of hiking trails, two restaurants, and mind-bending views of Mt. San Jacinto State Park and the surrounding region. 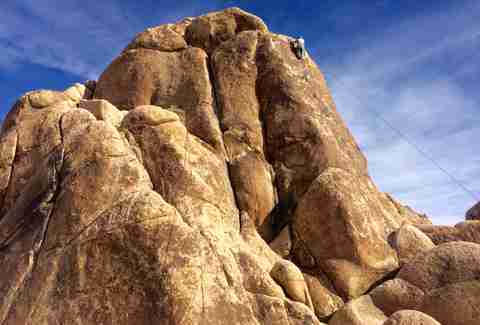 If you’re looking to gain some elevation with your own strength, Cliffhanger Guides offer rock climbing tours in the area and throughout Joshua Tree National Park. Whether you’re a beginner who is proud after climbing a flight of stairs or an experienced climber looking for a bit of guidance, their friendly and helpful crew will help create customized climbs that are fun and challenging. For the Don Quixote and eco-nerd in all of us, Palm Springs Windmill Tours, offer an up-close look at those towering 300ft wind turbines that you’ve driven by countless times on the 10. Plus, as with most tours around these parts, you’ll stop for a date shake -- and that’s never a bad thing. 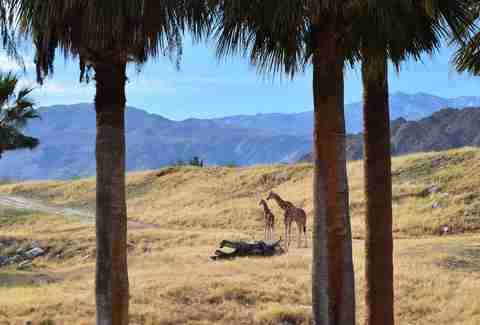 Finally, if you’re looking to check out some of that wild, wild life, you’ll definitely want to explore The Living Desert Zoo and Gardens. This unique spot is dedicated to conservation efforts and features over 1,200 sprawling acres, featuring botanical gardens, hiking trails, and over 450 wild animals from desert environments of North America and Africa, so you can get an up-close look at everyone from desert bighorn sheep to giraffes. Give your aching feet a break and saddle up for a horseback ride and experience the desert just like they did in Westworld... err, the old West. Family-owned Smoke Tree Stables offers guided trail rides throughout the Indian Canyon Trails, and if you bring a large posse, they’ll even host a cowboy cookout for you. While the odds are against you running into Dwayne “The Rock” Johnson out in the desert, you can still get an up-close look at the San Andreas fault thanks to Jeep tours and bicycle tours hosted by companies like Big Wheel Tours. 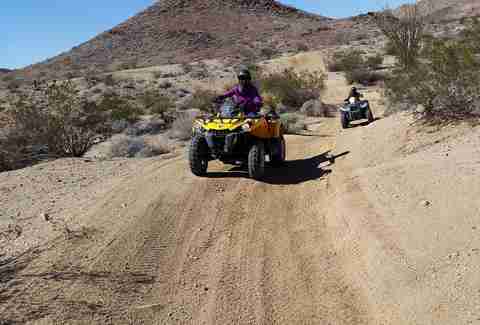 Explore the colorful canyons, rugged landscape, and desert wildlife on backcountry off-road tours, see where General Patton trained troops with tanks for WWII, and grab a date shake (obviously) at Oasis Date Garden or Shields Date Garden along the way. If you’re looking to get your adrenaline pumping even more, you can also go off-roading in ATVs and dune buggies with ATV Experience. Or, you could take to the open road and rent a motorcycle or one of those crazy three-wheeled Polaris Slingshots from EagleRider, which will even help map out a journey for you. You can also put your driving skills to the test at the BMW Performance Center at the Thermal Club, where you can test the limits of the newest cars on a 1.6-mile road track, an off-road course, and more, all with a spectacular desert backdrop. If you’re looking for a place to stay during your desert adventures, the Miramonte Resort and Spa serves as an excellent home base. It’s partnered with Big Wheel Tours, Cliffhanger Guides, the BMW track and other adventure-focused companies in the area, so you can coordinate door-to-door pick ups for many of the nearby excursions. That said, if you happen to find yourself relaxing in the boutique hotel’s pool or spa after your adventures or sipping a cocktail on the bocce court or at the fire pits, we won’t tell. If you’re not content to get your thrills on terra firma, there are plenty of options in Palm Springs to take flight and see the desert from an entirely new perspective. Sure, you’ll get some incredible views from the Tramway, but you can rise even higher and gently drift over desert landscapes, date farms, and more during a hot air balloon ride with Balloons Above. For that old-timey, Indiana Jones-type experience, you could also climb aboard a 1940 Stearman Biplane and soar above Palm Springs and the Coachella Valley with Palm Springs Bi-planes. The flights range from 15 minutes up to an hour, and you can sit side-by-side with your fellow adventurer in the open-air cockpit. Just try not to drop your phone when you’re taking a selfie. Danny Jensen is a regular Thrillist contributor who will happily go off the beaten path in Palm Springs any day, but won’t turn down a spa visit if you insist. Follow him off road on Instagram and Twitter.